Earlier in the year, the Ministry of Defence in the United Kingdom modified two of the Naval Toasts following the Loyal Toast in the Royal Navy after centuries of ‘tradition and privilege’. The amendments were necessitated by cultural changes that have (slowly) transpired over the course of centuries to reflect that women have been entering and moving up the ranks of the Navy, whether in the UK, the US and many more, and also women having a more frequent presence in the merchant marine fleet worldwide as well. The toasts were well-meaning and appeasing to good fortune and self-serving individualism, but also reflecting the practices and the mores of the times – such as Tuesday’s toast ‘To Our Men!’ mirroring that all onboard were men, from the Captain down to the lowly boatswain. The toasts were also reflecting personal aspirations for promotion, like Thursday’s toast to ‘bloody war’ and ‘sickly season’, as engagement in battle usually meant high casualties that hopefully would translate to a promotion for the lucky surviving members of the crew. Likewise, Friday’s toast to a ‘willing foe’ and ‘sea room’, few navy fleets had the strenght and capacity to engage the Royal Navy, and the crew who was looking for ‘prizes of war’, the wish was for a gutsy enough enemy to engage in a battle and get caught or clear the way allowing plenty of ‘sea room’ for the Royal Navy to sail over the world. Besides the self-serving, ritualistic and cultural artifacts of such toasts, one has to keep in mind that all sailors were men, at the prime of their virility, away from women – whether wives, fiancées, mistresses or ‘women of pleasure’ – living under limiting living conditions in terms of space, victualing and privacy, under strictest laws and hierarchical rules, risking their lives on a daily basis whether battling the elements of nature, the frigates of the enemy or exploring unknown navigational routes. No wonder, that the above formal naval toasts were apt to ‘commentary’ during the formal salutes in a male-dominated, rowdy environment where adrenaline and testosterone had to be kept on fine balance: Wednesday’s toast ‘To Ourselves’ was usually followed by “As no one else is Likely to Concern Themselves with Our Welfare’, while most famously (or notoriously) Saturday’s toast ‘To Sweethearts and Wives’ elicited from those in attendance ‘May They Never Meet!’ Captain ‘Lucky’ Jack Aubrey (Russell Crowe) in the movie ‘Master and Commander, The Far Side of the World’ is the one cheerleading this line with his officers. During the past summer, two changes were imposed by the Ministry of Defense: changing Tuesday’s toast to ‘To Our Sailors!’ (instead of ‘to Our Men!’) and Saturday’s toast to ‘To Our Families!’ to reflect that men and women are almost equally likely to be serving the country or the Captain aboard a ship and the language had to be politically correct. There always will be those who are traditionalists and nostalgic of the past, and certainly high ranking officers objected to these ‘historical’ changes, but again, we all have to adapt to the times. 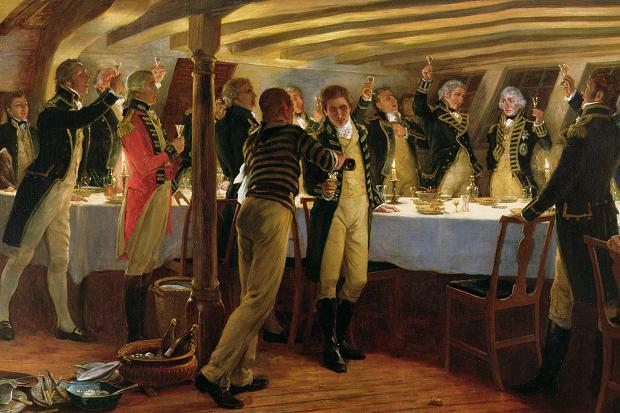 At least, officers in the Royal Navy still maintain the tradition to be the only branch of the armed forces allowed to toast the Sovereign and proffer their naval toasts while sitting. No one really knows how the tradition started, but it is believed that a king onboard (possibly King Charles onboard the Naseby in 1660) bumped his head at a low beam while toasting, and made it a rule to allow for toasting while sitting. One has to remember that the height of the decks at sailing ships barely allowed for men to fully stand up in any case, and that the tables and the settees were fixed to the floor, and thus, rising to toast while maintaining a dignifying posture was almost impossible. Besides these ‘authorized’ toasts, there have been many more over the years. As expected, a great deal of them could be considered today sexists, or racists, or chauvinistic or immoral; again, no wonder since they reflect different ages and were prepared by men at the top of their virility having to be kept under short ‘leash’ and not knowing whether tomorrow may be their last day of their short life. II’m Popeye e Sailor Man I live in a Grabage Can I like to go swimmin’ With bow-legged women I’m Popeye the Sailor Man! I love to go swimmin’ With bow-legged wimmin And swim between their legs Swim between their legs. And sometimes, it was ‘bare naked women’. There is no definition of a ‘bow-legged’ woman in the Oxford English Dictionary (OED), but it’s believed that there were good at horse-riding and thus the connotation that they were ‘easy’ to copulate with. Here’s to lying, cheating, stealing and drinking If you’re going to lie, lie to save the life of a friend If you’re going to cheat, cheat death If you’re going to steal, steal the heart of the one you love and if you’re going to drink, drink with friends both old and new! PLEASE DO LET US KNOW WITH ANY GOOD NAVAL TOASTS WE ARE MISSING!! This entry was posted in Maritime History and tagged Basil M Karatzas, Karatzas Marine Advisors & Co. on November 30, 2013 by Karatzas Marine Advisors & Co.. Since antiquity, the bow of vessels has not only been used to plow the waters efficiently, as a matter of function and purpose, but also it has been used as the anthropomorphic facade of an inanimate object to face the sea and the risks associate with it, known and unknown, the weather elements and the superstitions emanating from the limited body of knowledge at the time; like the hood and the masque of today’s cars, the elaborate construction of a vessel’s bow was also a symbol of wealth and power of the vessel owner (status symbol with today’s car market) but also medium of intimidation of the fighting enemy for military vessels of the times past. 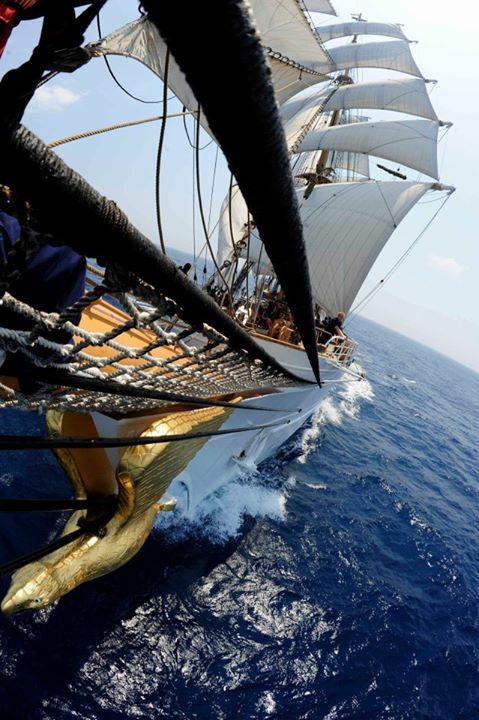 Each seafaring culture has brought their own traditions and beliefs in the motifs of figureheads, usually a wooden figure mounted on the vessel’s bow or on top of the main block of wood where the keel was anchored and whose finishing was perceptive to artistic interpretation. 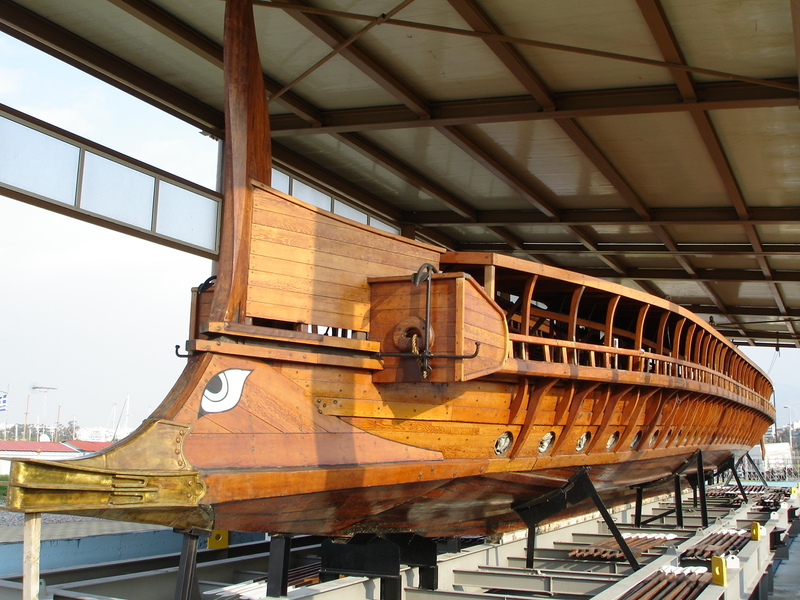 The earliest record that the prows of vessels were modified (decorated) beyond functional purposes date from the Egyptian times (usually depicting lotus or holy birds), while vessels of the Phoenicians were depicting horses for their vision and swiftness. Ancient Greeks were decorating their vessels with figureheads of boar’s heads (again, symbol of vision and ferocity) or with the ‘seeing eye’ (or ‘okulos’) which when mounted on both sides of the bow seemed like the ‘eyes’ for the vessel that could look out for the right direction and route, away from harm’s way and storms. Besides the metaphorical scope of looking out for the best route, the purpose of the eye also had been of an apotropaic eye to ward off evil influences, demons and bad spirits and monsters. Often the prow was covered with the fleece of a votive animal sacrificed to the gods before the departure in order to appease them and ensure safe passage. The Romans preferred figureheads of centurions to indicate military prowess but also figureheads of serpents and monsters in order to intimidate their enemies. 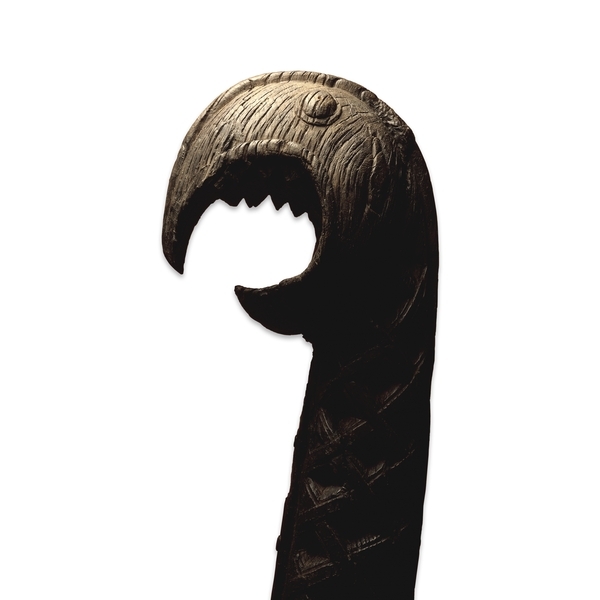 The snake and sea serpent motifs were also preferred by the Vikings for their longships in their exploring the North Atlantic, while Danes often decorated the bows with wooden statues of dolphins, bulls or dragons. By the 13th century, the swan is a common motif for the bows of vessels bringing in mind images of graceful mobility in the water. 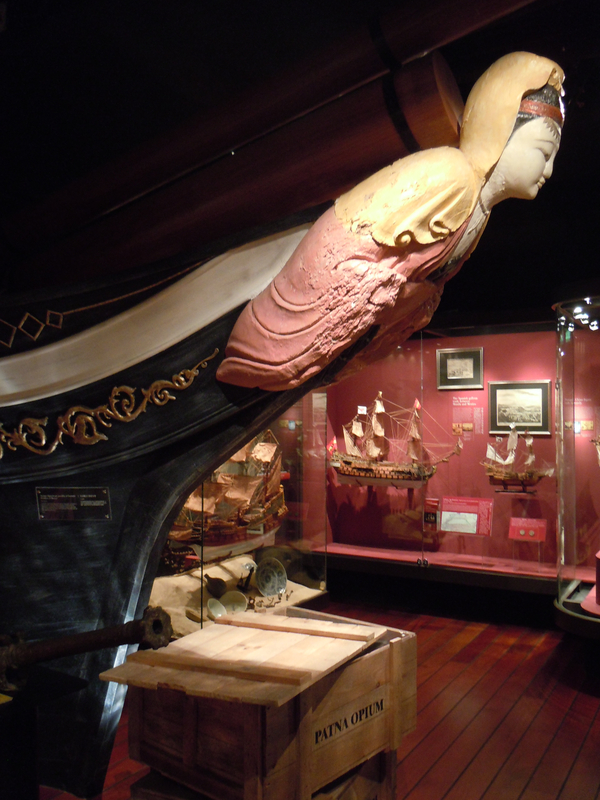 The female figureheads in the 18th and 19th centuries may now represent the shipowner’s wife or daughter and are properly dressed, or could be figurative representations of the society ashore and people’s aspirations at the time or artistic influences in the carvings, the decorations and styling. 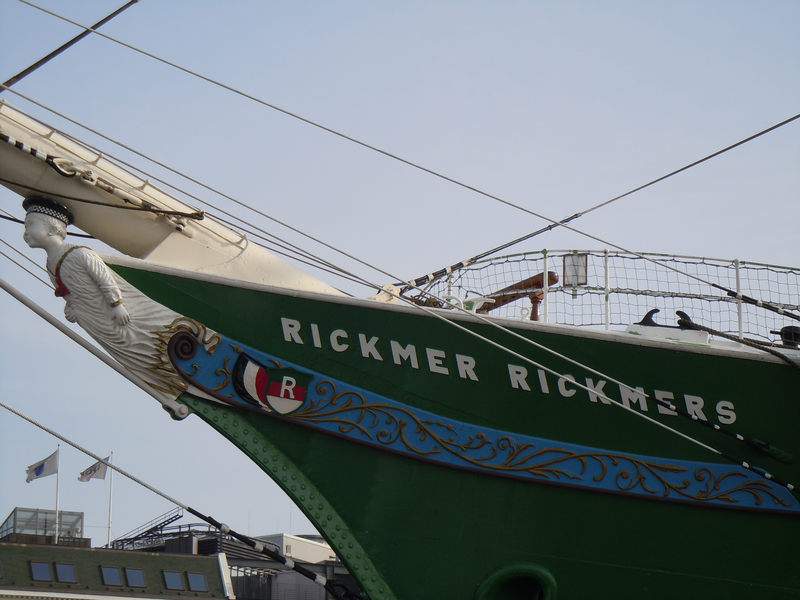 It was also acceptable to depict male figures as figureheads, usually the shipowner himself (square-rigger „Joseph Conrad” at the Mustic Seaport) or a son or favorite grandson (Rickmer Clasen Rickmers’ grandson Rickmer Rickmers is the little boy figurehead of the eponymous windjammer), but other male figures were acceptable alternatives, sometimes evocative of the origin or the trading routes the vessels are engaged to. Captain Death’s privateering ship aptly named the „Terrible” had skeleton as the figurehead while Surcouf’s French corsair „Revenant” carried a corpse. 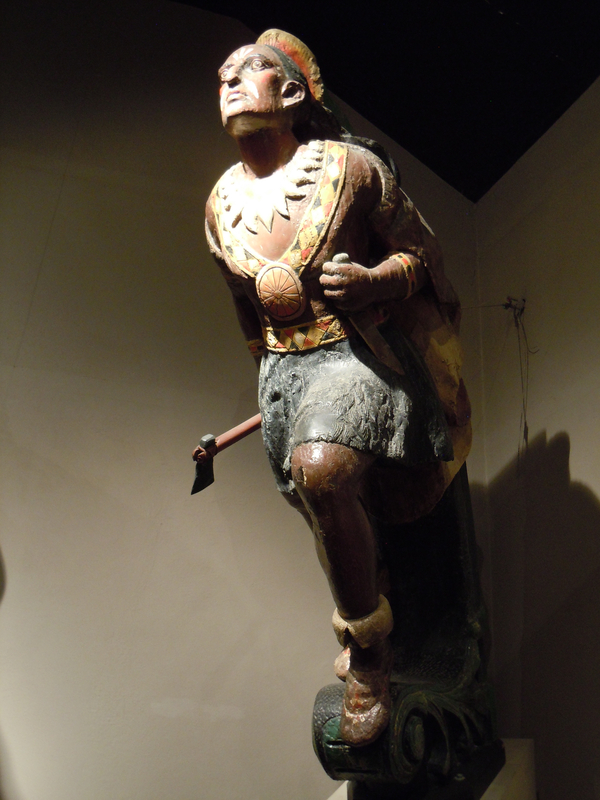 Military figures or representations of Olympian male gods, mythological figures, monks, saints, monarchs, etc were preferred figureheads for military vessels. In the reign of Henry VIII (1509 – 1547), the lion became the general British figurehead, and remained popular until the end of George II’s reign (1727 – 1760). 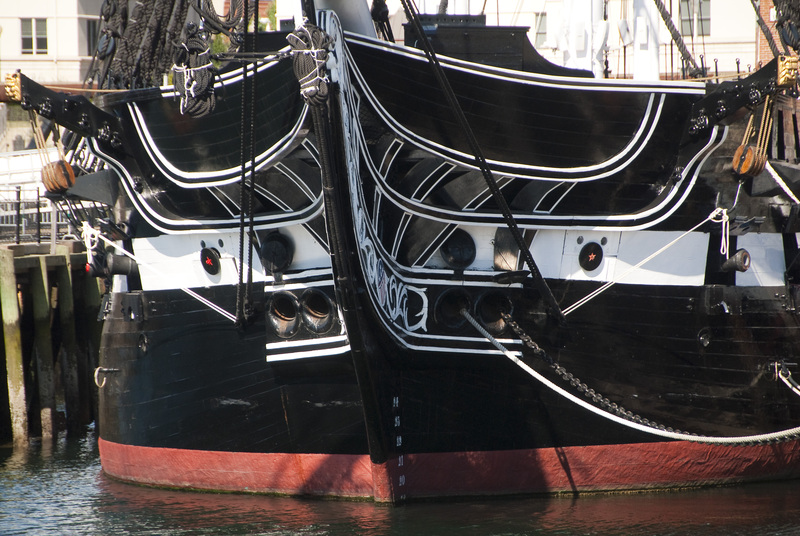 It was borne by such famous ships as the „Great Harry”, Elizabeth’s „Victory” (1569) and Sir Richard Grenville’s „Revenge” (1577), in the early days of the beak bow. In these vessels the figurehead took the form of a heraldic lion couchant or gardant. James I introduced the Scottish lion rampant, with a Royal Crown. Cromwell eliminated the crown, but Charles II restored it. He began also the custom of varying the figurehead for all first-rates, although the lion remained for ships of all other types. 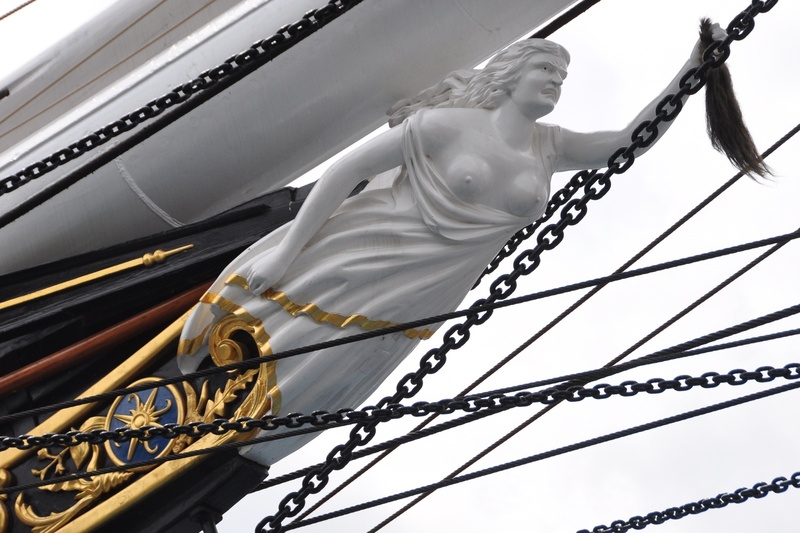 A famous and historic figurehead has been Nannie Dee witch on the clipper vessel „Cutty Sark”, a mean-looking female figure with long hair, both breasts exposed and with her left arm extended to the sea, where fresh seamen were to make a ‘mini’ cat-‘o-nine-tails from old rope and place it her hand in order for her to tame the sea elements. Actually, the long hairy tail in her hand in the original story was supposed to be a mare’s tail according to the Tam O’Shanter legend! By the mid-eighteenth century’s Royal Navy, the lion went out of fashion for ships of the second rate and below, and its place was taken by full-length figures. 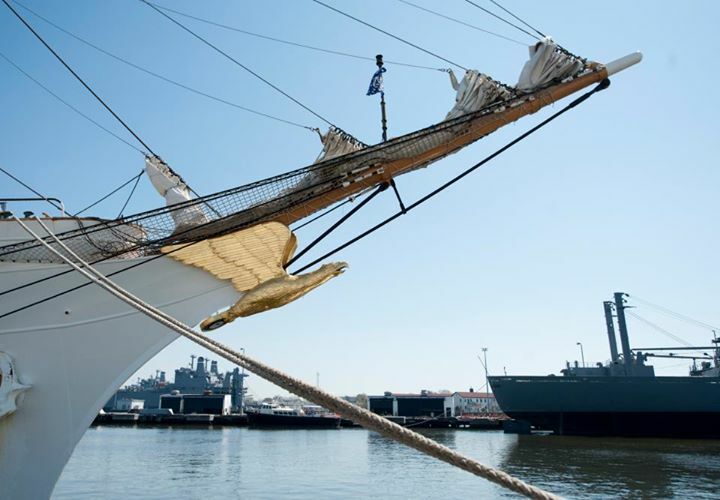 About this time classical names became more common for Navy ships, who were often borne by French prizes whose particularly gallant resistance had earned them a compliment of their names being retained on the British list. In such ships appropriate heads were often charming, but other vessels were given effigies of princes, politicians. 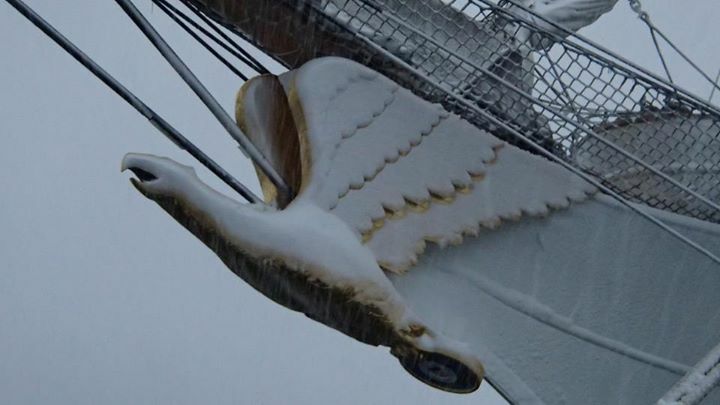 In the eighteenth century, the Admiralty made several unsuccessful efforts to abolish the figurehead because of its cost, also, a heavy figurehead projecting over the bow of the ship was a serious handicap to her sailing qualities due to weight and balance. In the 17th century, figureheads were made predominantly from elm, but usually from oak in the 18th century. 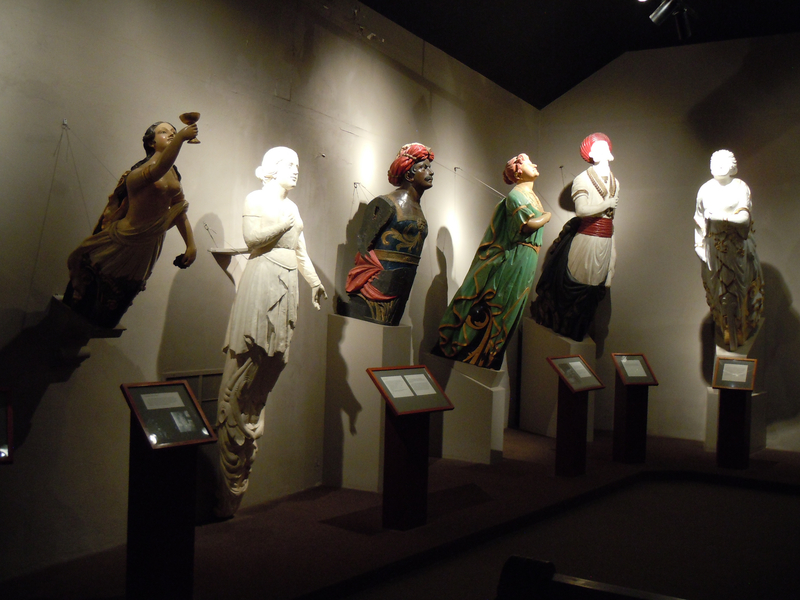 After an order by the Navy Board in 1742, figureheads were made from soft woods, such as pine, while deal and teak were also used as these proved to be more resistant to wood-boring insects and decay. For man-of-war vessels there was also the consideration that figureheads could be partially damaged during battles, and thus it necessitated to figures with extremities kept close to the torso that also could be easily repairable. Similarly, the Admiralty attempted to restrict the colors to gilt or white, but since the bluejacket preferred something in more than natural colors, the authorities were tactful and often turned a blind eye. The technological development of ships in the 19th century, from sail to steam and wood to iron, led to the gradual end of the naval figurehead and replacement by scroll work and “fiddleheads” or “billetheads” – the former curling inwards, the latter outwards, which were smaller, non-figural carving, most often a curl of foliage. The loss of the bowsprit, under which the figurehead was traditionally placed, was the main reason for the disappearance of the figurehead. Figureheads for larger warships were finally abolished in Britain in 1894, but some smaller ships kept them until WWI (1914-1918). 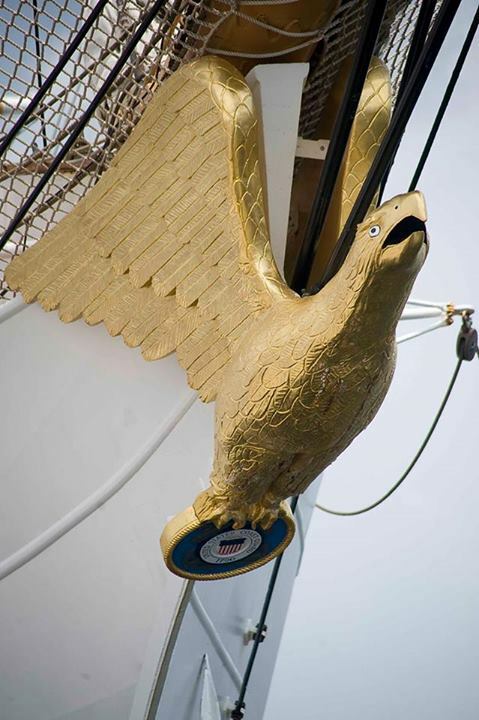 Later, ships had a medallion or shield (ship’s badge or ship’s seal or ship’s crest) a form of naval heraldry. 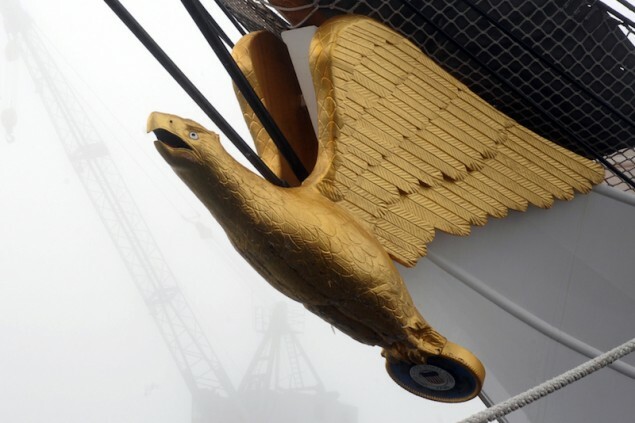 The last ship to have a figurehead in the Royal Navy was the HMS „Espiegle” (1880). 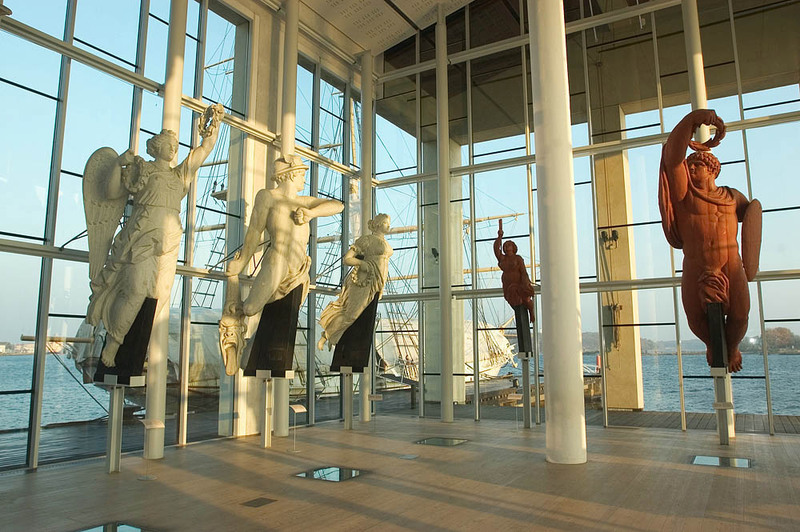 Several private collections worldwide and also museums have put together worthwhile collections of ship figureheads, relating a small artistically and cultural important aspect of maritime tradition. 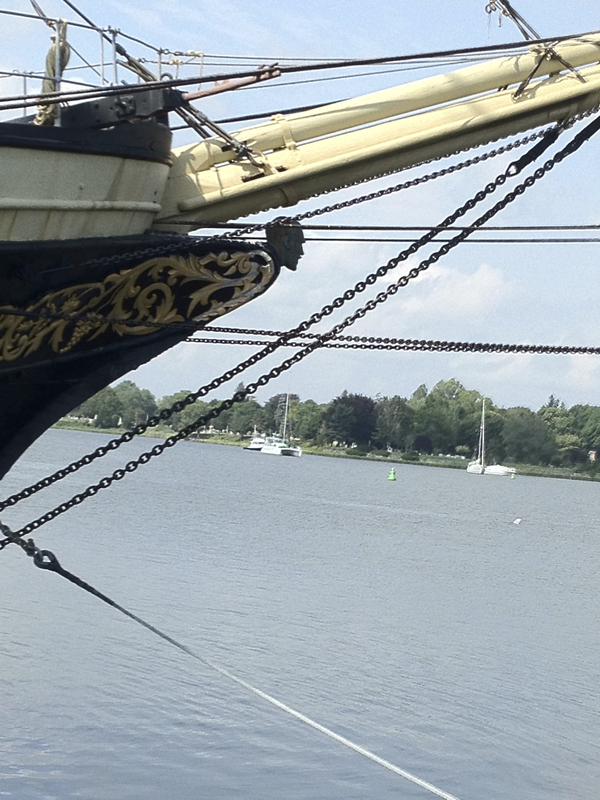 The Royal Naval Museum at Portsmouth, the MarinMuseum in Karlskrona, Sweden, the Mystic Seaport Museum in Connecticut, the Hong Kong Maritime Museum, the South Australian Maritime Museum, and many more. Hopefully, all these wooden figures will be preserved for future generations for their cultural value. This entry was posted in Maritime History and tagged Basil M Karatzas, Karatzas Marine Advisors & Co. on November 14, 2013 by Karatzas Marine Advisors & Co.. So far this year, the newbuilding market has been exceptionally active. 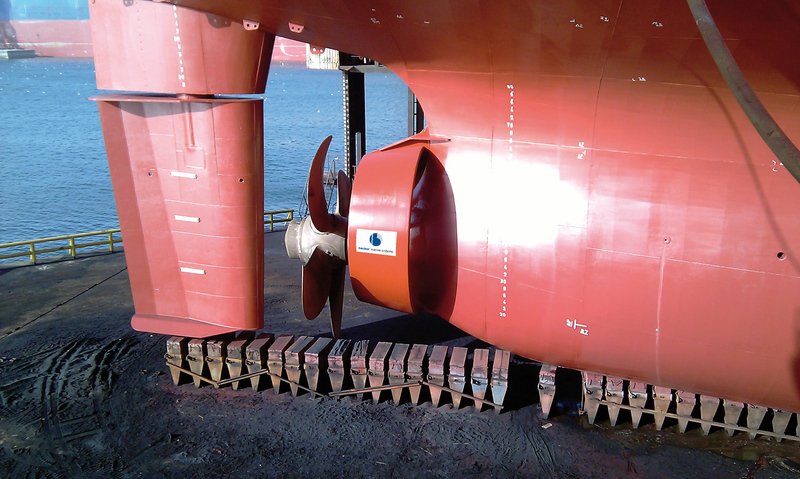 There are many reasons for that, primarily because shipping is entering a long-awaited recovery but also because ‘eco design’ vessels with their economic efficiencies are expected to send non-efficient vessels to the scrapheap. No doubt that competitive markets always navigate toward efficiencies eventually (whatever they may be) and the ‘new’ render the ‘old’ obsolete (one of the inimitable truths of nature); however, the level of newbuildings placed on order in most shipping segments, not only this year, but ever since the market crashed in 2008, assumes that older tonnage will just disappear and will find some corner of the world where they would go and die off quietly. There is no doubt that, during peak years of the cycle, owners were ordering vessels that they were expected to be delivered fast and start earning (big) money as soon as possible. Attention to detail for engineering and design and attention to workmanship were secondary priorities since any floating device with cargo carrying capabilities was making (big) money. Especially in the dry bulk market where there was and there is no ‘honor system’ of ‘major approvals’ (vetted and approved by oil majors) and in the market for smaller tonnage where a river bank and a crane were sufficient credentials to start shipbuilding operations (‘greenfield yards’), there is an unknown amount of the existing world fleet that will never reach their design life of about twenty-five years. It is difficult to quantify the percentage of the world fleet (primarily dry bulk and containership vessels, and again, smaller tonnage) that will have to get scrapped much sooner than later, but our own shipbrokerage experience and also anecdotal evidence suggests that in certain, particular asset classes more than 10% of the world fleet – again for certain market segments, may have to be scrapped in the next five years. However, does accelerated technological obsolesce combined with efficient modern vessel designs justify a world fleet outstanding orderbook of 17% across all market sectors when, in general, the world fleet is newer than five-years old? Let’s follow the industry practice: a charterer at any given market rate and at any given geographic location and within short chartering window (laycan) will charter on the spot market the best (commercial) vessel possible, that is the vessel with lowest fuel consumption and largest cargo carrying capacity for any given trade available at certain location and timeframe. Nominally, a brand new, efficient vessel with cargo maximizing holds would get the charter at such rate; it’s logic and good business sense. However, a vessel that is a tad inferior in fuel consumption or in cargo capacity but with a lower cost basis (was cheaper at acquisition time, or has been written down through good freight rate markets or the mortgage bank eased off on claiming timely payments) can afford to underbid the competition (the top notch vessel) and accept a lower rate, just because her owner can afford to or because the owner is desperate enough. Thus, the ‘bad’ effectively drives down the market and gets the business from the ‘good’; and, even if the good vessel manages to get the business (charter) at market rate, still, they have not earned any premium over the market to compensate for the savings that can generate for the charterer; they have earned the preference of the charterer to earn their business, but no much premium over the market. For period charter market where vessels are employed for longer periods of time where financial calculations can be more rigorous and market transparency lower (and also vessel delivery location and charter window can be known well in advance and thus there is sufficient time to be addressed vs. the spot market), the charterer will give more consideration and preference for the modern vessel, but never really will pay much premium above market and definitely will not compensate dollar-for-dollar for the savings they will earn from a modern vessel. Likewise, for charterers / traders working on Contract of Affreightment (COAs) where the cost is predominantly seen as $/ton or $/bbl (vs $/d for time charters), efficiencies are more important and stronger preference for modern vessels; again, there is never dollar-per-dollar to the owner for savings reimbursement; just the preference of doing business with modern, more efficient vessels, but never an ‘obligation’ or definite commitment. And, there always will be an owner with a lower cost basis or desperate enough to undercut the competition and any competitive advantage, and thus the whole ‘preference’ argument goes out of the window. Shipping is an almost perfect competition market, and there are very limited opportunities to earn a premium over market rate by providing superior product; shipping is a commodity business, a ‘need’ business and not a ‘want’ business like Apple’s (ticker: AAPL) where they charge for their latest cool phone exactly what the market can bear. 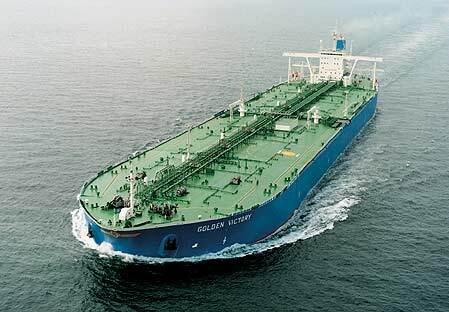 In the tanker market and the containership market where chartering standards and fuel efficiencies are a higher priority than in the dry bulk market, poorly designed and maintained tankers and containership vessels will become obsolete sooner than dry bulk vessels, ceteris paribus. However, it does not mean that overnight, older tankers and containerships will become obsolete and magically disappear off the market. 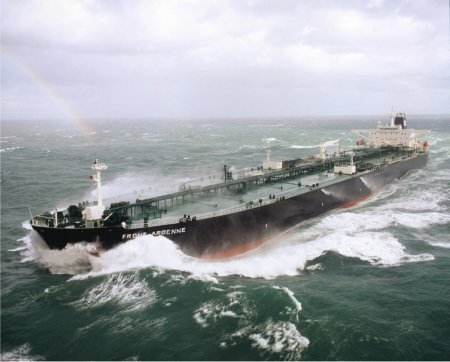 After all, the MT „EXXON VALDEZ’ accident in 1986 brought into effect OPA 90 regulations that forced single-hull tankers out of the market only in 2010, a cool 24-year later. 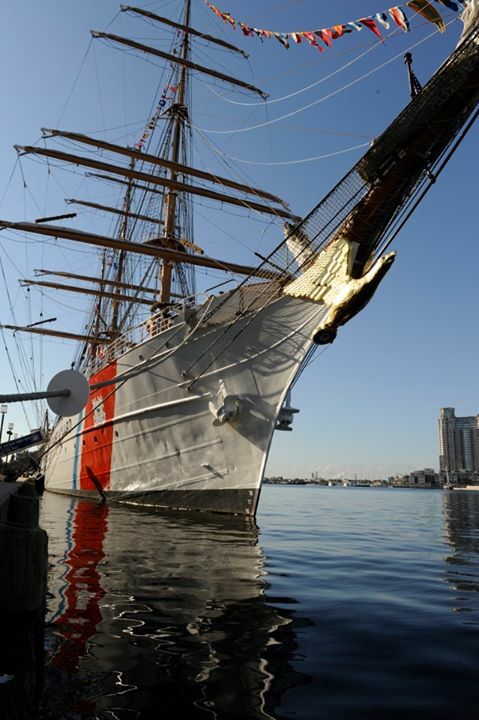 Usually, the charter market and the $ sign are more effective at driving the market than regulations, but again, scrapping a vessel, especially a modern vessel, is hard thing to do; it’s easier to give hell to competition and underbid the market first rather than irrevocably sell the vessel for demolition and take the loss. For the dry bulk market, where charter and regulatory standards are lower and where there is a very, very long tail of charterers, those vessels can be kept profitably in the market for many, many more years to come. Our argument is not against efficiencies (and savings and transparency) in shipping; we are strongly for it. However, we think that the newbuilding story has been taken to the extremes and accepted at face value. 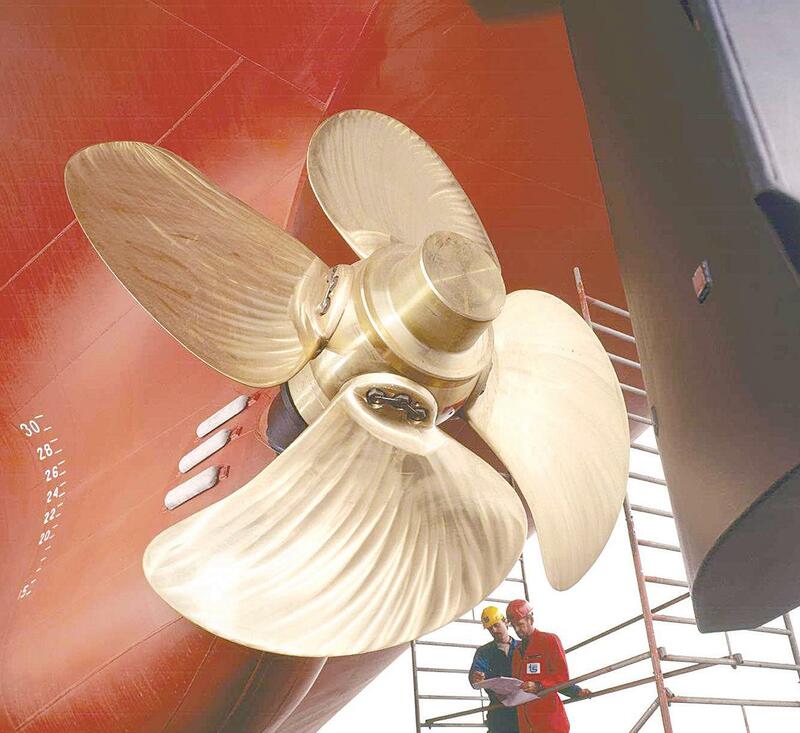 There has been the argument that equally commendable fuel efficiencies can be achieved by modifying existing quality vessels (with ducted / MEWIS duct propellers, etc) at a relatively low cost ($1-2 million per vessel, depending on vessel size), proposals that have been suggested or already implemented by companies like Danaos Corporation (ticker: DAC), Ardmore Shipping (ticker: ASC) and Euronav (ticker: EURN). This entry was posted in Shipping Market Economics and tagged Basil M Karatzas, Karatzas Marine Advisors & Co. on November 8, 2013 by Karatzas Marine Advisors & Co..